Calls come in many forms and often challenge us in unexpected ways. God put before us the chance to write a new story as PCUSA adopted a new marriage definition. This was a story of open and honest discussion, passionate feelings, deep prayer and intense study of the Bible as we sought the Holy Spirit’s guidance. In 2016, Lakeside Presbyterian approved an open marriage policy in response to what we believe is God’s call to broadening inclusiveness; this is a call that can be seen in the thematic arcs of biblical interpretation, grounded in love, and expressed through opening our arms to our sisters and brothers who have been rejected for too long. The pastors of Lakeside Presbyterian Church will celebrate weddings in the sanctuary (traditional, formal weddings) or at a location of your choice, time permitting. You do not need to be a member of Lakeside Presbyterian Church to be married here. To be married in the church sanctuary we require you to attend (at least) one Sunday worship service before we agree to the wedding and (at least) two during the months of planning for your service.The fees to be married at Lakeside Presbyterian Church are roughly $1,350. A wedding is a worship service, and thus what we do is to the glory of God. 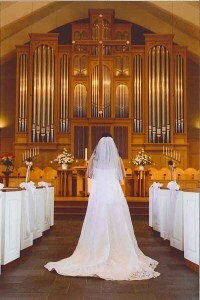 Sanctuary weddings will employ live music (no recorded music) performed by instrumentalists and vocalists. To schedule a wedding in the sanctuary, please contact the church office (859) 341-1963 to determine if your date is available. Once we have checked the date, you will schedule a first meeting with the pastor. At that meeting he or she will review the flow of a wedding, provide you with our wedding policies, and answer any questions you have. After you have attended at least one Sunday worship service, and returned the form with your deposit, we will schedule your wedding. To schedule a wedding away from the Church Sanctuary, please directly contact the minister to determine whether the date is possible and what other details need to be considered to schedule your wedding. At least one of you must be a professing Christian in order to be married in any Presbyterian Church. While there are many choices you can make regarding your wedding service, the rules of the church regarding music, photography, and the specifics of worship are not negotiable.